YinYang and the art of playing it out as a unit. At first glance the spectators eyes simply see the flowing motions, when Tajiquan is being practiced in its slowly exercised form. Just the very experience of practicing itself, it reveals, how much vital-energy (Qi) comes into play and into life in this field. Tajiquan is an art one can get deeply being moved and touched. It unites the natural principles of life... within the constantly changing flux of Yin&Yang. Millions of People on earth are practicing, enjoying and loving it. Who ever is willing to give it a place in his heart, is growing in the certainty, why so. Current workshops, classes and fees at your request. Body follows Energy follows Intention. Taijiquan is "de-tente" in practical form. Körper folgt der Energie folgt dem Geist. Yin-Yang - und die Kunst, beides in Einheit anzuwenden. Bewegungen, wenn Taijiquan in der langsamen Form geübt wird. einlässt, wächst in dem Wissen, warum. Aktuelle Termine, Workshops Kurse und Preise auf Anfrage. 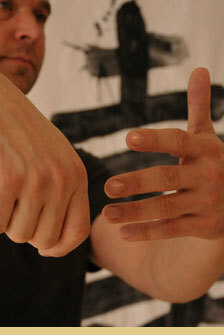 Weitere Details zum Thema Taijiquan finden Sie hier.